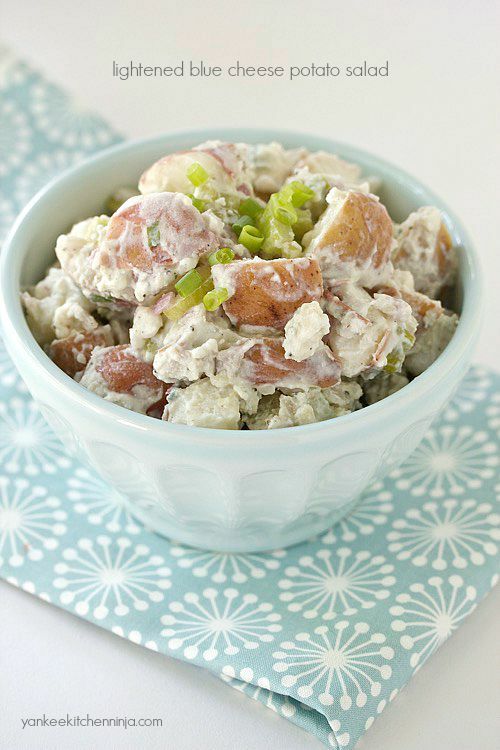 I've been making this blue cheese potato salad for as long as I can remember. It's so perfect, in my book, that I don't really bother to make any other kind. While I love the little red new potatoes in it (skins on for extra nutrients and fiber) and love LOVE the blue cheese, I also feel good about eating it and bringing it along to a potluck or cookout because it's a lightened recipe, with no mayonnaise. That's right: hold the mayo. We're getting all this good creaminess from light Greek yogurt instead. Plus, it's super easy to prepare -- but you wouldn't expect anything less from The Ninj, now would you? 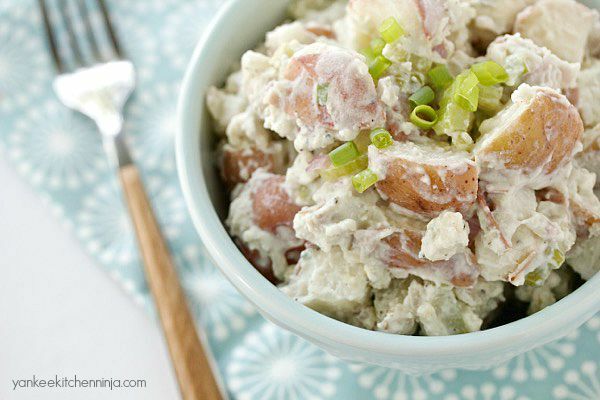 So whether you still have weeks of summer BBQs in your future or are just looking for a summery side for a back-to-school weeknight dinner, you can't go wrong with this lightened blue cheese potato salad. Is it late summer or early fall where you live this week? Leave a comment: The Ninj wants to know. Place the potatoes in a large saucepan and cover with water. Bring to a boil and cook 8-9 minutes or until tender when pierced with a fork. Drain and cool for about 10 minutes. Whisk together in a large bowl the yogurt, milk, vinegar, salt and pepper. Stir in the blue cheese, then add the slightly cooled potatoes, celery, shallots and green onion. Toss gently to coat. Cover and chill for at least 2 hours prior to serving. I so agree back to school should be after Labor Day Jules. Summer is just kicking in around here. No cords for us yet, thankfully. 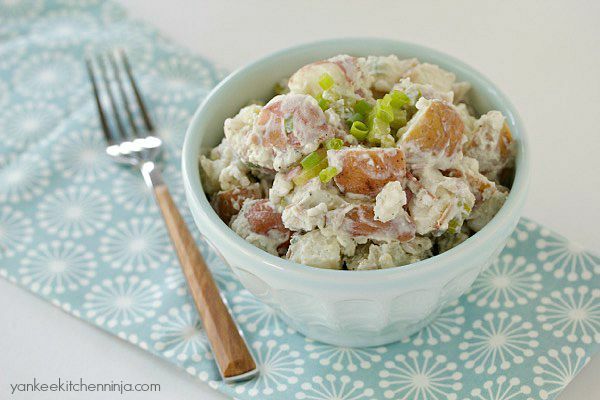 Great lightened potato salad. Love all things blue cheese. This one's for me! We don't start back to school for a few more weeks, but it seems to be early. I remember labor day too. Love that you added blue cheese to this salad. I would love it along side grilled steak! Yum! That's exactly how I prefer it, too, Katie -- thanks for stopping by! Heck my kids went back LAST week! It is crazy early, I hate it. They do get out in the spring several weeks before their yankee cousins, so I suppose it works out. I think this potato salad recipe will ease at least MY pain.